Two Champions were crowned at the historic first ever ASP event in China on Thursday. 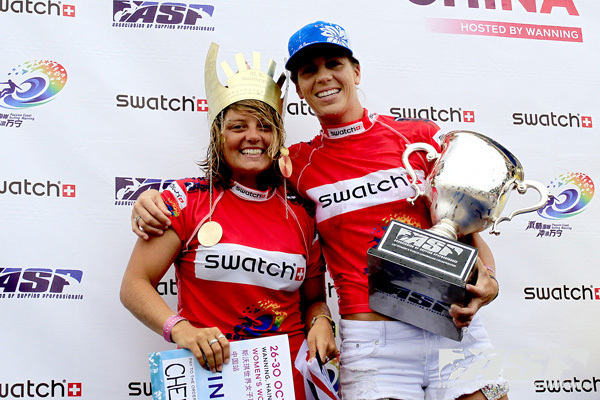 Chelsea Williams won the SWATCH Girls Pro China and Lindsay Steinriede (USA) has taken out the 2011 ASP Women’s World Longboard Title. Chelsea Williams (AUS) was without a doubt the standout performer of the SWATCH Girls Pro China, so it was only fitting to see her crowned the winner. Williams defeated Kelia Moniz (HAW) in an action packed Final with the conditions turning on for the 2 best surfers of the day. Both surfers notched big scores, but it was Williams who continued her dominating run to claim her maiden ASP Women’s World Longboard Tour win. "I’m so happy to win the first ASP event in China," Williams said. "It feels amazing to be here and surf against everyone, they were all surfing really well. Fortunately for me it was on a left-hander which rarely ever happens, so I was just stoked to show what I can do on my forehand. I think this has been a longtime coming, I’ve come close to winning so many times so it feel amazing to finally win one." Despite losing in the Quarterfinals to eventual event winner Chelsea Williams (AUS), Steinriede had amassed enough points to take the crown after winning the first event on the ASP Women’s World Longboard Tour in France and coming 5th here in China. "I feel awesome!" Steinriede said. "I knew I didn’t have control of the outcome so I was just letting it happen, and it just went my way so I’m really happy. One of the first things I came in and said to my husband after I lost was that I’ve had a lot worse things happen to me, I was just trying to stay positive. To be able to still be in the Title race was awesome and to actually win it, well it’s just sinking in and I think I’m going to cry." Steinriede surfed fantastic all event, putting her full repertoire and smooth style on display for the Chinese crowds on the beach, but couldn’t get past the standout surfer of the event Chelsea Williams. Steinriede won the ASP Women’s World Longboard Title when the last contender standing, Kassia Meador (USA) lost to young Hawaiian Kelia Moniz (HAW) in the Semifinals. "I was devastated because I didn’t want to leave it to chance, but I was more devastated because I didn’t get that wave I wanted," Steinriede said. "My emotions are still up and down because I really wanted to be in the Final, but that’s ok, I’ll take the ASP World Title!" Kelia Moniz (HAW) finished 6th on the ASP Women’s World Longboard Tour ratings after her 2nd place finish at the SWATCH Girls Pro China today. This is a breakout event for the 18-year-old Hawaiian who’s already looking forward to the 2012 ASP Women’s World Longboard Tour. "It felt great to make the final, and beat Jen (Smith) and Kassia (Meador), that’s a big accomplishment for me," Moniz said. "Then to surf with Chelsea (Williams) in the final was great. As much as I wanted to win, there’s always next year, I’m already looking forward to coming back here and to France. China has been amazing, the community and the event volunteers have been great, they’ve treated us like royalty and we’re so grateful." Kassia Meador (USA) finished equal 3rd today at the SWATCH Girls Pro China, cementing her spot as runner-up to the ASP Women’s World Title. If Meador had won the event she would have won the title, but she fell short against the young Hawaiian Moniz in the Quarterfinals. "I feel great, I’m not much of a contest surfer so the fact that I came close to the ASP World Title is fantastic," Meador said. "I’m just stoked to be in China surfing with all the girls, and to lose to Kelia (Moniz), there’s not many people I’d rather lose to, she’s like a little sister to me. It was such a fun heat, you do what you can and I fell short, but I’m so happy to make the finals. I’m so stoked that Chelsea (Williams) won! She’s always the in-form surfer at these events so it was due time that she won."